While AirAsia is discontinuing its Mumbai-Kuala Lumpur- Bali flight from end of April Garuda Indonesia will begin direct flight between Mumbai and Bali from 23rd April. In the beginning there will be two flights per week-Monday and Thursday and the airline is promising an additional flight on Saturday from June. The non stop flight time will be seven and a half hours. 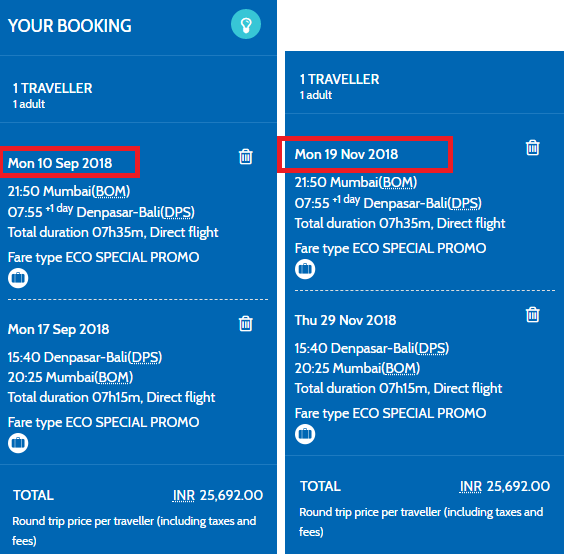 While the advertised fare is INR 23000 return, for several date combinations I tried several dates in April & May- got much higher fares- around 55-60k round trip. Just not worth paying 50k for Bali-30k should be max even on a full service airline. My guess is cheapest seats on each flight are already taken. I found low fares for future months- like September and November, when return fares for 26k are still available. This seems to be the lowest price. 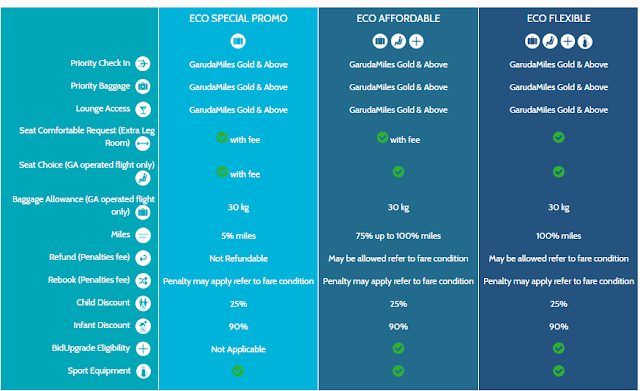 Garuda Indonesia's lowest fare includes 30 kg baggage and meals, but seat selection and everything costs extra. There're slightly more expensive premium fares which come with more benefits. Refer below table. Garuda Indonesia is using a same booking system used by Srilankan and Fiji airways- there is no modify search option- need to re-enter all input one more time. Blogger Divyakshi Gupta has done a detailed review of her Garuda Indonesia experience. (She flew Bangkok-Jakartha on Garuda. How about connectivity from other cities in India? Malindo Air flies to Bali one stop via multiple Indian cities. Malindo will be one stop via KLIA1 but they operate from multiple Indian cities, fares similar or cheaper than Garuda and service is good. So do check them out. Saw your pics- entire flight for yourself, business class n all.. Will wait for the post.